It turns out that Infected Mushroom isn’t some kind of embarrassing and painful ailment, but rather a ‘make it all sound bigger’ plug-in developed by Waves in collaboration with the titular duo Erez and Duvdev, and incorporating many of their mixing tricks. 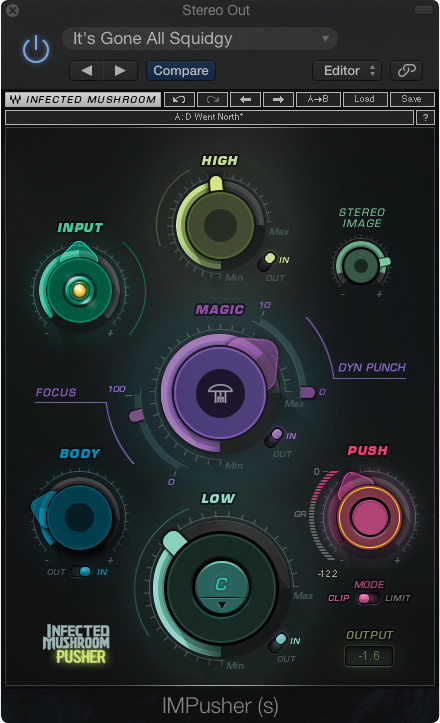 IM Pusher can be used for mastering, mix–bus processing, subgroup processing or track processing, and might best be described as a multiband sonic enhancer feeding into a dynamics section that offers a choice of limiting or clipping. 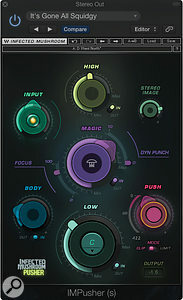 The plug-in can be used in mono-in/stereo-out or stereo-in/stereo-out configurations, but has relatively few controls, with bypass buttons for each of the relevant sections. When a section is bypassed its control is darkened to show that it is not contributing to the result. A wide range of factory presets is included to give you an idea of the treatments available, and the manual encourages a ’try it and see’ approach rather than anything too formal. Adjusting the input knob until the indicator in the centre shows yellow ensures optimal operation. If the indicator shows red more than very briefly, the input gain is probably set too high, whereas too much green means it is too low. As its name suggests, the Low control enhances low frequencies in both dynamics and harmonic content, and to my ears, has much in common with filtered and mildly overdriven parallel compression. It is possible to adjust the frequency below which the Low process comes into play based on either note or frequency: musical notes and their frequencies are shown on a pull-down menu. Body enhances the lower mid-range while High adds brightness to the treble, but in a less aggressive way than some of the harmonic enhancers I’ve tried. The Magic control in the centre enhances and boosts the dynamics of all frequencies, and two associated controls adjust the Focus and Dynamic Punch of the enhancement. There’s no real description of what these actually do, but their names give you a clue as what to expect: Dynamic Punch really brings out drum hits, while Focus adds a little brightness. Stereo Imager spreads the stereo field only in the higher frequencies so that the bass end of the spectrum is not compromised. Like most of Waves’ apparently simple plug–ins, adjusting a single controls can make quite a lot of changes behind the scenes. As for making it louder, Push brings in a variable degree of either clipping or limiting. Limiting gives the cleanest result, as you might imagine, while anything more than moderate clipping can sound dirty and aggressive, though sometimes that’s just what you need, for example to add life a to a dull snare drum. At lower clipping levels the result is still surprisingly clean-sounding. A gain-reduction meter next to the control shows how much processing is taking place, and the output is never allowed to exceeds -0.1dBFS regardless of how much drive you apply, so things just get more compressed and dirtier the harder you push. I have to say that the creative range of this plug-in is quite extraordinary, and while the clipping mode can make some things sound exceedingly unpleasant if overdone, it’s good to have it as an option when needed. For cleaner ‘bigging up’ jobs, the limiter option works really well (as do lower clipping settings) and because of the multiband enhancement aspect of the plug-in, it is possible to make some types of material sound very much louder without killing the dynamics. Processing EDM is an obvious application, but used more subtly, the processing can also work well on gentle ambient electronic music, pop mixes and both instrumental and vocal tracks. Used more aggressively it can add a lot of depth to drums, while the separate HF enhancement control means that the top end doesn’t get lost in the process. That stereo width control also works extremely well, adding interest and a sense of space to a mix or submix without disturbing what the lows are doing. My first thoughts were that this might only be a plug-in for the radically minded, but it turns out to be very versatile, and capable of great subtlety on the one hand or quite radical enhancement on the other. Perhaps most surprising is that this is a very affordable plug-in. IM Pusher really is a magic mushroom that can add loudness, weight, polish, sparkle or grit as required to virtually any style of music.